The best way to avoid being injured in a dog bite attack is to take the proper steps to make sure that such an attack does not happen. That may sound trite, but the reality is that preventative steps can save people from terrible injuries or even worse. The California dog bite lawyers at the Dog Bite Law Group have been fighting for the rights of those injured in these attacks for some time now, and while we are always passionate about defending the rights of our clients, we are also people who love dogs as much as anyone else. There are basically three categories of people who are related to dog bite attacks: dog owners, adults, and children. We’d like to offer some ideas for each in hopes that somehow, these ideas will help people prevent dog bite attacks before they happen. If you have been injured in this type of incident, please contact the firm as soon as possible to schedule a free consultation so we can evaluate your case. Select your dog carefully. Do not make a dog an impulse purchase. Socialize your puppy as soon and as much as possible so it’s comfortable around people and other dogs. Learn what your dog’s body language means. Here is a comprehensive guide, courtesy of yourdogadvisor.com. Protect your dog from situations where it feels threatened, teased or defensive. Spend whatever time is necessary to properly train your dog so that it understands basic commands. Make sure you give your dog enough exercise every day so that it does not get pent up and act out. Use a leash when walking the dog in public. Spay or neuter your dog as soon as it’s advisable. If your dog is going to be outside, secure the area with a fence or some other structure or measure. Above all else, make sure that you supervise any interaction between your dog and others, particularly children. If a strange dog approaches you, remain calm. Do not try to make yourself big or imposing. Instead, turn sideways to make yourself small. Slowly back away from a dog that looks menacing with your arms folded. Do not run – this will engage the dog’s chase instinct. If the dog attacks anyway, try to “feed” it something, such as a purse, a jacket or a bag. If it knocks you down, curl up into a ball and cover your head, face, and neck. Perhaps the most important factor in these situations is remaining calm. If you allow your fear to overtake your decision-making process, you could panic and things could escalate. Do not approach a dog when it’s sleeping, eating, caring for puppies or chewing on a bone. Do not approach a dog that’s barking or growling. Always ask for the dog owner’s permission before petting an unfamiliar dog. Do not put your face anywhere near the dog’s face at any time. Do not try to hug or kiss the dog, as this could be misunderstood by the dog. Do not come up from behind a dog or startle it in any way. Do not tease, chase or otherwise harass a dog. Remind children that these are not toys. Generally speaking, the best way for a parent to try and avoid encountering dog bite problems is to do your best to watch your child constantly when he or she is near a dog and to provide regular feedback and guidance. We know kids will be curious and be kids, that’s why we urge you to do what you can to the best of your ability. However, the ultimate dog responsibility falls on the owner or keeper, etc. As we said, we hope that dog bite attacks stop occurring, but we know that obviously isn’t going to happen. 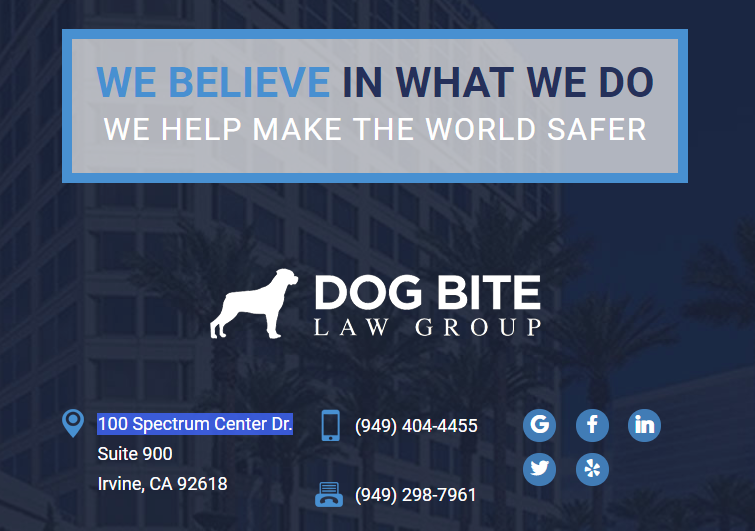 If you or someone you love has been harmed in this type of a situation, contact an Irvine Dog Bite Attorney at the Dog Bite Law Group as soon as possible to schedule a free initial consultation.